Located in Bedford County,PA, the Authority was created to service Bedford Township citizens with public water, using a system of water wells, and to convey wastewater to Bedford Borough wastewater treatment plant using multiple sewer lift stations and miles of sewer pipe. The Authority is managed by an appointed five member board of directors who hold public meetings the first Wednesday of each month at 4:00 p.m. 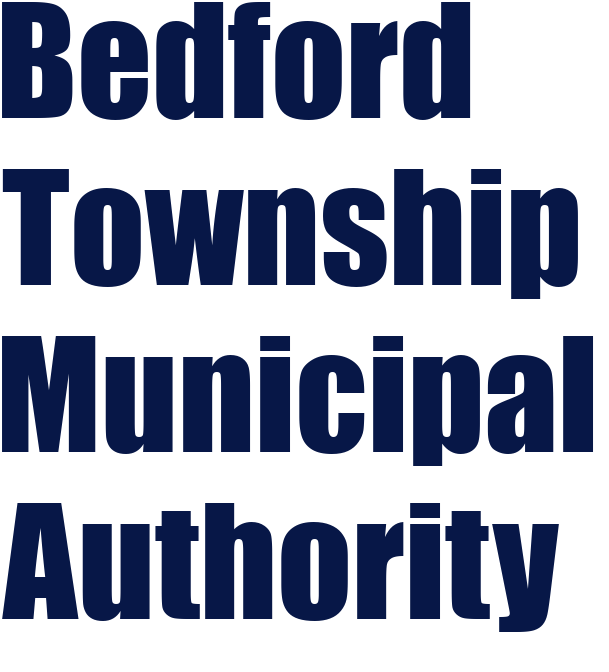 The meetings are held in the meeting room of the Bedford Township Municipal Building at 1007 Shed Road, Bedford, PA. The Authority employees 5 full time operators to maintain the system, a full time secretary and a full time manager. The manager, Amy Melius, can be reached by telephoning the office. The Authority retains Stiffler, McGraw & Associates, Inc., 1731 N. Juniata St. Hollidaysburg, PA as its engineering firm. Timothy Cooper is the contact at Stiffler McGraw for water and sewer projects. The Authority retains Attorney Dean Crabtree, Esquire, Bedford,PA. as its solicitor. The Authority has quarterly sewer/water billing to over 1,200 connected township properties and the rate for water is $12.50 per 1,000 gallons and the rate for sewer is $18.50 per 1,000 gallons, with a minimum billing of 6,000 gallons per quarter. The Authority maintains specification for infrastructure with a set of Rules and Regulations. PLEASE UPDATE THE BTMA OFFICE WITH DIRECT CONTACT INFORMATION FOR EMERGENCY NOTIFICATIONS. Payment is due in the BTMA office by 3:30pm on the due date to avoid late fees. To view your account or make a payment online go to https://bedfordtwp.authoritypay.com. There is no fee for paying with an electronic check (ACH) from your bank account. A service fee of 2.65% of the transaction amount applies to credit card payments. This fee is collected by the third party vendor at the time of the transaction. A drop box is available outside the office for deposit of payments. Cash, check and credit card payments are accepted in the office M-F 7:30am to 3:30pm.